Yes, it is that time of the year again. Christmas, the perfect day to take a stroll on the beach. Why on Christmas? Because one can. Because the waves are nice. 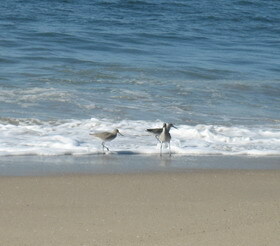 Because the sandpipers are fun to watch. Because one can climb dunes and enjoy the view over the sea. So beautiful. I must say, I’ve always thought the topography of CA was just gorgeous. Think what it must have been like before humans overran it. Is that your husband in the photo? Distinguished looking gent. Yes, California is beautiful. The variety of the landscape is so wide and so amazing. I know that many people consider the “lack of seasons” in SoCal a drawback. But hey, we do have everything, even snow in winter in some areas high enough. And there certainly are seasons in NorCal – boy, do they have seasons! The one drawback is the overcrowding in some spots. And then again, it is not overcrowded everywhere. There is plenty of space left nearly untouched by human hand. And you know what – nobody wants to live there. Not lively enough. If work would not force us to live in the city we would be out in the desert. Well, maybe one day we can make out dream come true and live in a tiny house somewhere where it is peaceful and quiet, with our own flock of California quail in the backyard and the odd friendly coyote coming by. (Not for the quail, though.) Strangely enough I am a true desert rat. Give me heat and rocks and dust and I am a very, very happy camper. I love desert terrain, too. The hotter the better.